Decreasing Moon – seen from Hamburg. Credit: Wolfgang Fraedrich, (distributed via imaggeo.egu.eu). This picture shows the decreasing Moon on May 6, 2015, two days after the full Moon, as viewed from Hamburg, Germany. 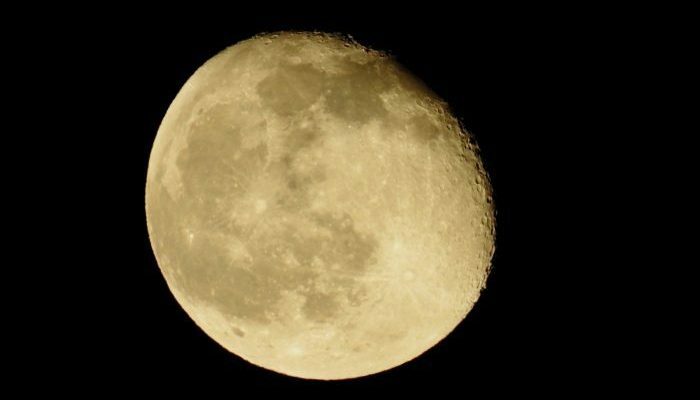 There are still 96.4% of the lunar front illuminated. The Moon does not glow on its own, but its surface reflects the sunlight. The Sun always illuminates a complete half of our natural satellite, which, in its orbit around our planet, always turns its face (which we see at full Moon) toward the Earth. As the Moon is in constant motion with respect to the Earth and the Sun, the angle of view of the Moon – and thus its phase – changes from day to day. The particular angle at which the illuminated, visible lunar surface appears depends on latitude. Near the equator, for example, the boundary between the light and shadow sides of the crescent is approximately horizontal. In the northern hemisphere, an increasing Moon is illuminated on the right, a waning Moon on the left. In the southern hemisphere, the phases of the moon appear reversed: the illuminated surface of the Moon increases from left to right. 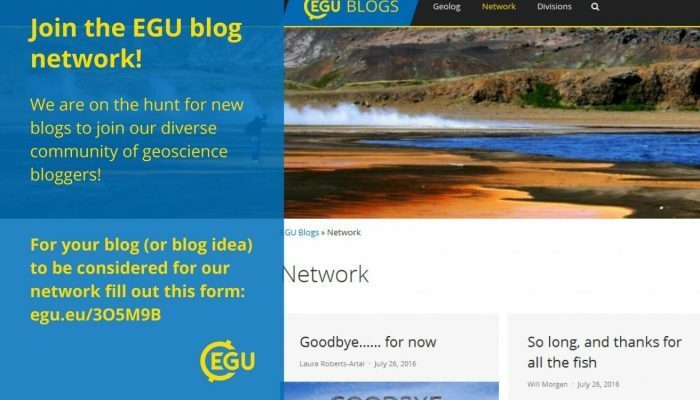 The EGU blog network is getting a make-over! Since 2013 the network blogs have enjoyed thought-provoking and engaging contributions by Simon Redfern, Dan Schillereff and Laura Roberts, Jon Tennant, as well as Will Morgan on a range of topics: from the workings of the inner Earth, through to geomorphology, palaeontology and air quality. However, the individual circumstances of the bloggers now mean that it is no longer viable for them to regularly update their blogs. As such, it is with sadness that we announce that we are saying goodbye to Atom’s Eye on the Planet, Geology Jenga, Green Tea and Velociraptors and Polluting the Internet. From the EGU, we thank Simon, Dan, Laura, Jon and Will for contributing excellent content to the blogs and wish them the very best of luck for the future. To complete the make-over, we’d like to find new blogs to take the place of the departing network blogs. If you are an Earth, planetary or space researcher (a PhD student, an early career scientist, or a more established one) with a passion for communicating your work, we’d like to hear from you! We currently feature blogs in international development (Geology for Global Development), geochemistry (GeoSphere), volcanology, (VolcanincDegassing) and geopolicy (Four Degrees). We’d love to receive blog proposals from fields within the Earth, planetary and space sciences we don’t yet feature. The network aims at fostering a diverse community of geoscience bloggers, sharing accurate information about geoscientific research in a language understandable not only to fellow scientists but also to the broader public. You, as an expert in your own research area, are in a better position than we are to share recent development in your area of research. The benefits: apart from your site gaining exposure by having its posts listed on the front page of the EGU website, we will also share highlights of your work on our social media channels (Twitter, Facebook, LinkedIn, Google+, Instagram) and advertise the blog network at our General Assembly, which has over 12,000 attendees. And, of course, you’ll get to join a great community of bloggers! With the exception of VolcanicDegassing, the network blogs are authored by early career researchers. In this call for bloggers we are particularly keen to add diversity to the network, and particularly welcome applications from more established scientists. Having an existing blog is not a requirement for application. However, if you don’t have a blog already, we’d like you to have at least some experience of writing for a broader audience, be it as a guest blogger, or contributing to outlets such as The Conversation, for instance. In this case, let us know what you’d like your blog to be called, what topics you would cover, and link to articles you’ve published in the past. If you’d like your blog (or blog idea) to be considered for our network, fill out this form by 8th August. Please note that only blogs in English will be considered, as this is the EGU working language, and the language of the blog network. We particularly encourage applications from all European countries, not just English-speaking countries, but bloggers from outside Europe can also apply. Feel free to contact the EGU Communications Officer Laura Roberts if you have any questions. In the meantime – happy blogging! Welcome back to the second day of the 2016 General Assembly! Today is packed full of excellent sessions, and this list of highlights is by no means comprehensive! Make sure you complement this information with EGU Today, the General Assembly newsletter, to get the most out of the conference – grab a copy on your way in or download it here. This year, the General Assembly has a theme – Active Planet – and to celebrate it there will be Theme lectures on active planet (TL) exploring the Earth’s extraordinary variability extending from milliseconds to its age, from microns to the size of the planet. Today’s first themed lecture (TL4) features the Earth’s outer shell and considers what remains to be explored in carbon/life interactions. It takes place from 13:30 to 15:00 in room 0.93. The second theme lecture of the day will focus on earthquake-volcano deformation cycles that occur over human time scales. (TL2: 15-30 to 17:00 / Room 0.93. There’s more to the theme than lectures though! If you brought a photo print-out to the conference that represents the theme, you’ll be able to find a large world map in the entrance hall, to which you can affix your picture. Be sure to place it in its point of geographical origin! Throughout the week, a nice photo collage will be formed representing the attendees’ view on our Earth. You can also head on over to GeoCinema, where you can kick back and relax with a geological film (10:30–19:00 daily in the GeoCinema Room, 0.90 on the yellow level), while watching films which celebrate the conference theme. Today’s pick is Dziani, Jurassic lake, showing from 14:00. We also have an incredible Union-wide session lined up: Geosciences in the Anthropocene (US5, 13:30–17:00 in L6). It will bring together geoscientists, historians, social scientists and journalists to explore and debate not only the geological questions, but also the political, cultural and economic implications of living in the Anthropocene and what it means for the future. You can also follow the session on Twitter (#EGU16SSE) and catch up with the EGU 2016 webstream. The first of this year’s Great Debates takes place today too and discusses one of the great challenges facing humanity: are there enough resources for us all? Depletion of natural resources has been an ongoing discussion, but there are those who think that the limit to resources is our imagination, while others strongly feel we ought to consume less. Join in the debate from 13:30–15:00 in E1. You can follow the session on Twitter with #EGU16GDB, and, if you’re not attending, tune in with the conference live stream. The day is full of fantastic scientific sessions, from the coevolution of soils, landforms and vegetation (SSS9.1 / BG1.19 / GM5.5 / NH3.18: from 13:30 in Room -2.20), through to precipitation uncertainty and variability (HS7.2 / AS1.10 / CL2.20 / NH1.20/ NP10.4: Orals from 13:30 in room B / Posters from 17:30 / Hall A) and a lecture on the outcomes of the Paris climate talks (SMP69: Room 2.31 as of 17:30). There are also eleven Medal Lectures today, in various areas of the geosciences, so make sure to check the programme so that you don’t miss them. The Alexander von Humboldt Medal Lecture by Trond H. Torsvik (ML3: 12:15 – 13:15 / Room E1) is being streamed live. If you’re an early career scientist (ECS), this year’s conference has more than ever on offer for the ECS community, and today is a bumper day, packed full of ECS-related activities. 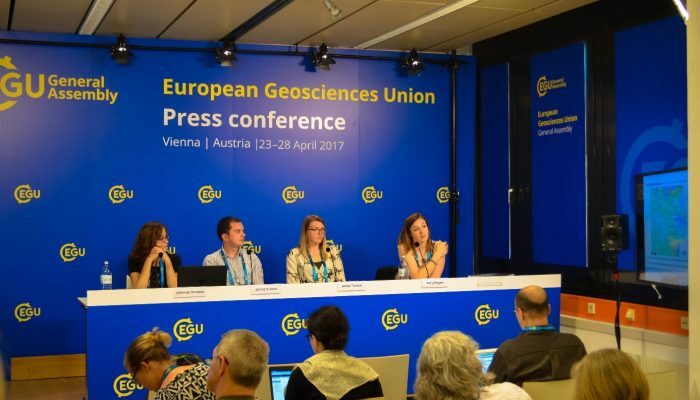 Meet the EGU Union-level ECS Representatives (Laura Roberts, Lena Noack, Wouter Berghuijs) at the EGU Booth from 09:15 to 10:30, to find out more about the Union and how to get involved. 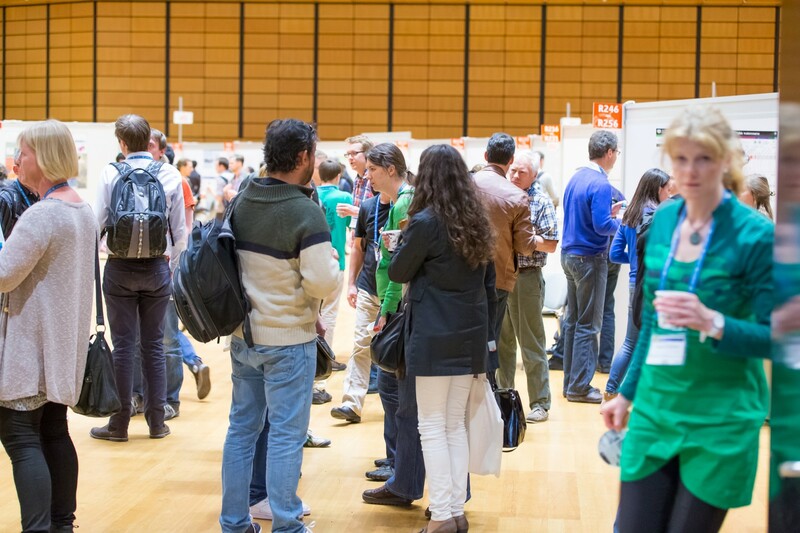 If you want an opportunity to network and meet established scientists who can offer advice on anything from how to prepare a research grant to how to balance your research and personal life, why not come along to the EGU Medallists and Early Career Scientists Reception – now open to all ECS members – from 19:00 in room F2. Light snacks and drinks will be served when you arrive! And there’s a suite of smaller Splinter Meetings organised by conference participants too. Why not join the discussion as to whether the current system of open access and peer review is really satisfactory (SMP2: 17:30 – 19:00 / Room 2.43)? Otherwise, learn about Radiation Belt Models (SMP10, 10:30 – 12:00 in 2.42) or join the ECS Division Meeting for Natural Hazards (SMP25, 08:30–10:00 / Room 2.17).